I couldn’t help myself. 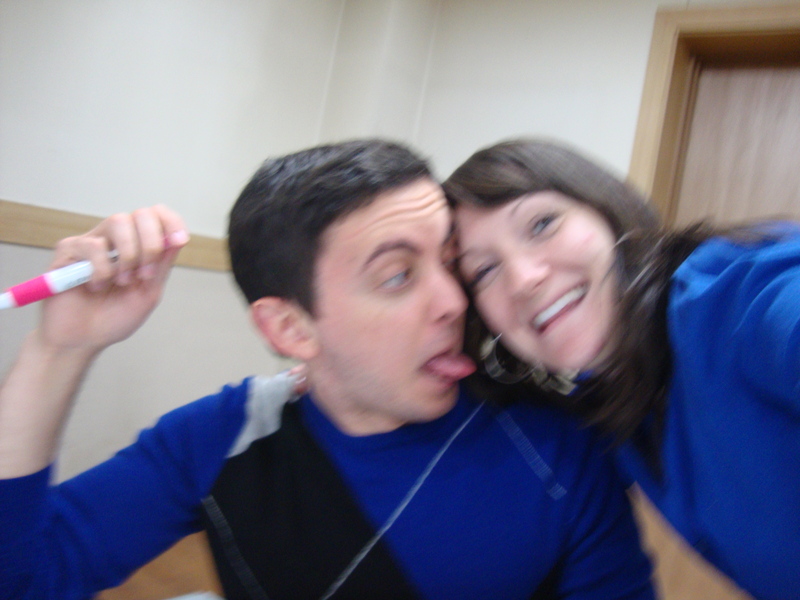 I have been in Daegu now for about 8 months. 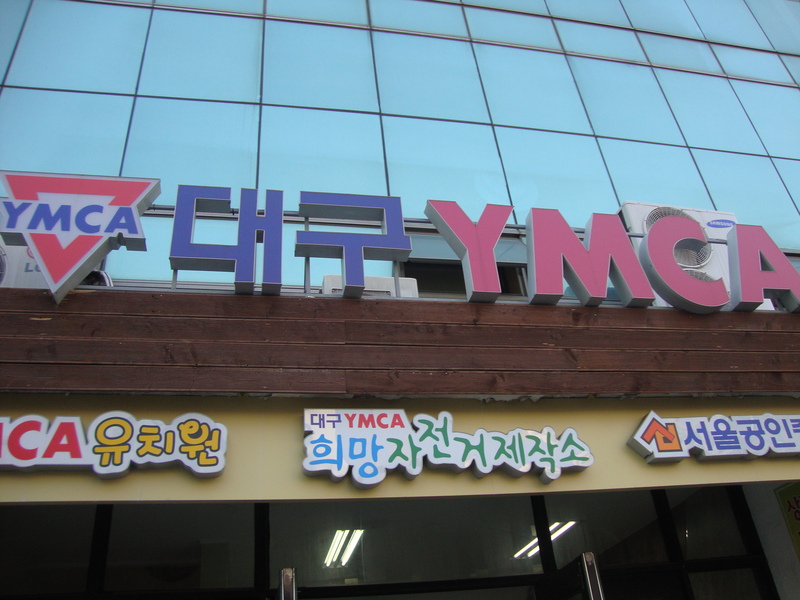 For 7 of them Jeff and I have been taking Korean classes at the YMCA in downtown Daegu- right outside of Banwoldang subway station, exit 14. 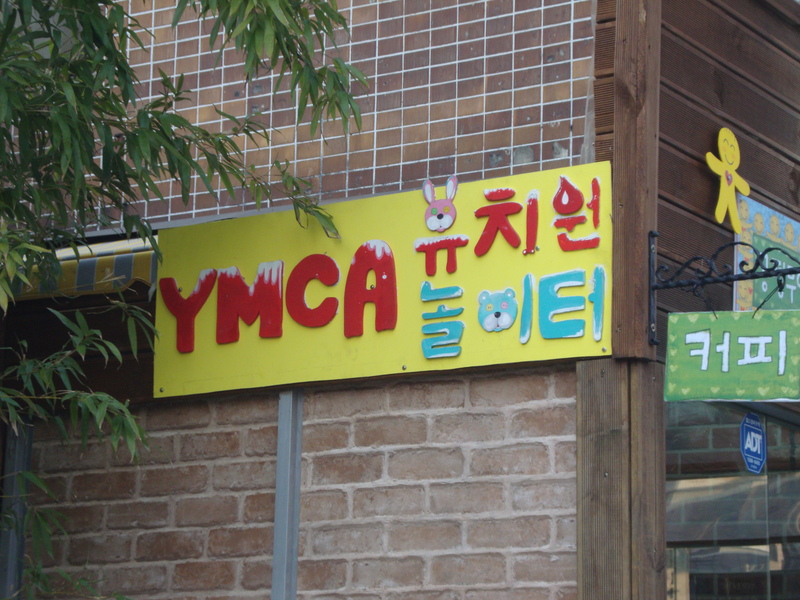 The YMCA in downtown Daegu where we take our Korean classes. 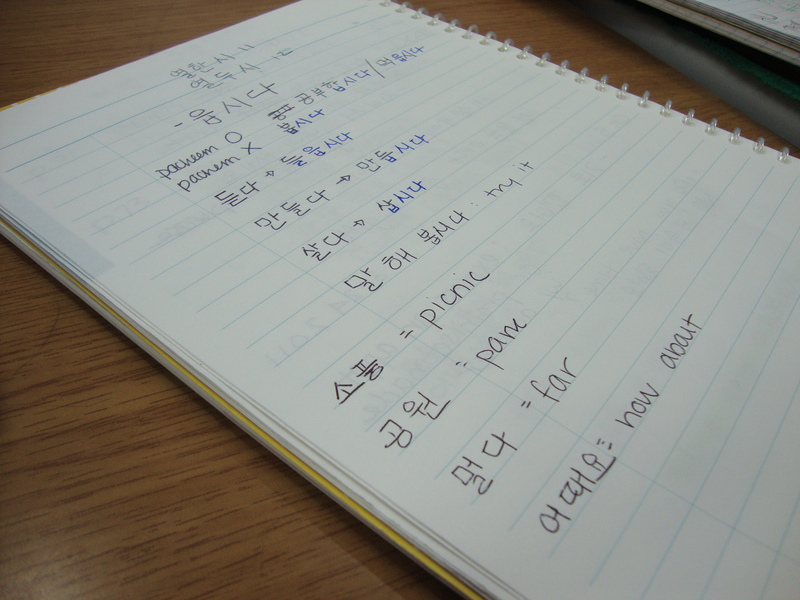 When I started the class I didn’t know how to read hangul. Every word I wrote down an ‘English’ pronunciation right next to it. There were so many processes that my mind had to go through that the actual vocabulary and grammatical structures that I learned, did not stick so much. 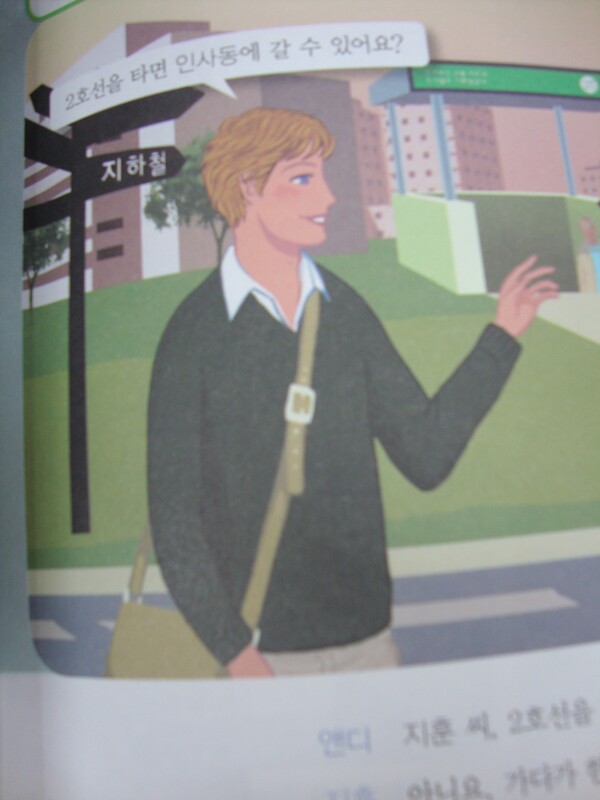 Currently, I am in ‘2A,’ for advanced Korean speakers. This is not me, but since I finished all of the books before 2A- thats where I am. I have come along way since the beginning and I have my people from the YMCA to thank! I really enjoy taking the classes here and all of the staff are far beyond helpful! 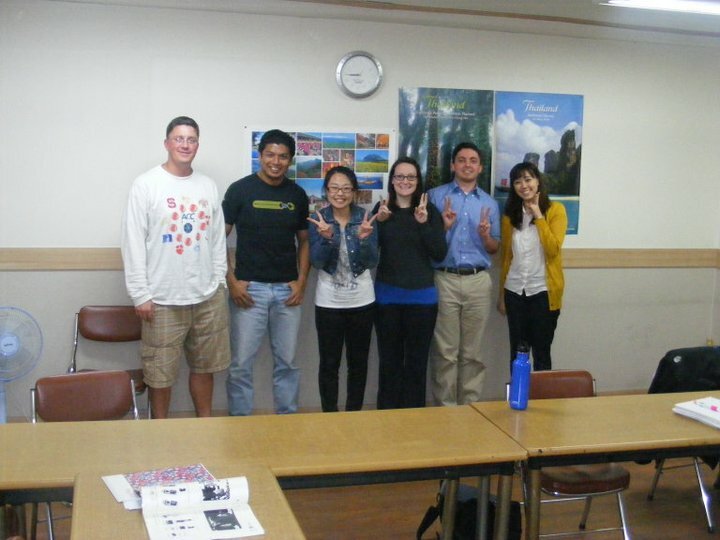 They are very encouraging and try to make 2 hours of Korean grammar twice a week from 7-9…a fun task. My 1A class…back in September. My teacher Boseon and I checking my homework. Jeh-poo in the background. Our sweet little class. From the left Paul, Iskandar, Boseon, me, Jeff, and Jaiway. As I said earlier, I am taking the 2A class. You might think “Wow, great job!” or “You go, girl!”- Whichever is your type of encouraging saying buuut…now its my second time taking 2A…First time around my class consisted of me and Jeff. It was AWESOME!! Yep, this is basically what class was like sometimes. Jeff and I just got to try out every new vocabulary word and grammatical structure carefree! 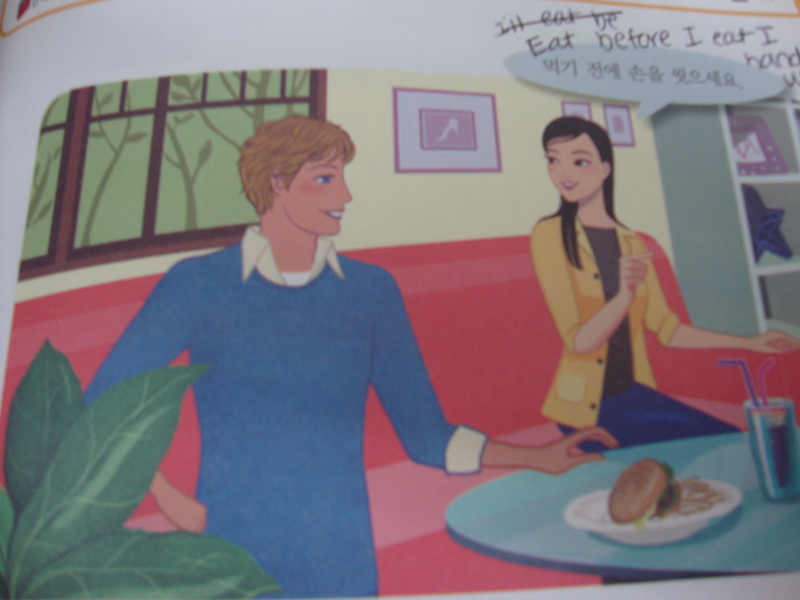 We use text books for our Korean class from called the Sogang series. I actually like the way that they are laid out and introduce a fair amount of vocabulary. The only down fall is you have to constantly see Andyshe. Andy being the lost foreigner in Korea again. 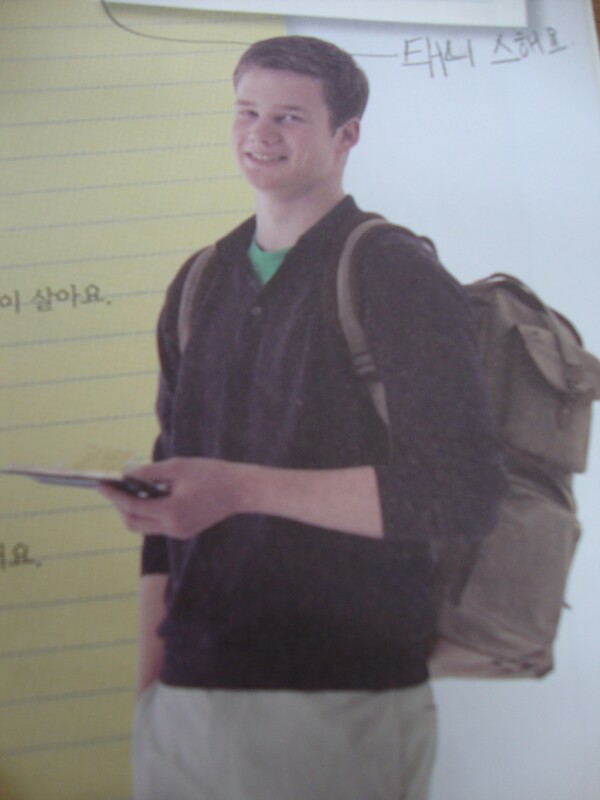 As you can see, Andy is a major part of my learning Korean. He introduces us to new phrases so that when we are in a boarding house we know how to ask what type of rooms they have, haha. Although Andy is great, he is not the best part. 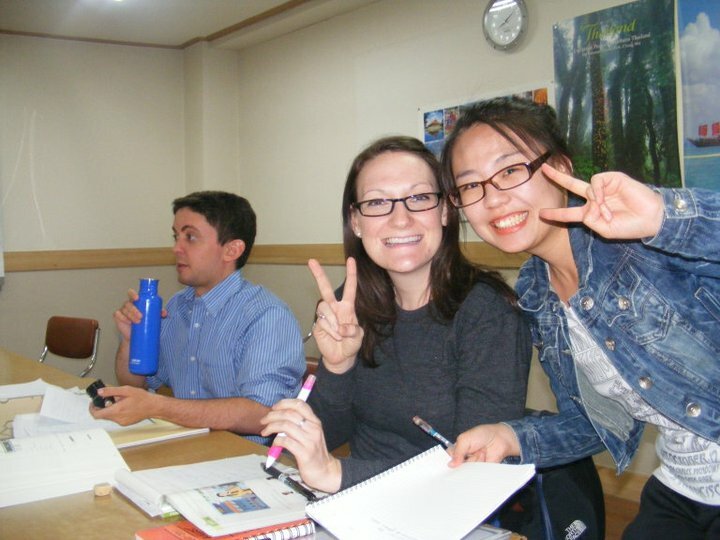 Our teacher Sagong Jin, is really an amazing teacher and person. She is studying to become a teacher and teaching people like Jeff and I in the evenings. She really enjoys teaching and you can tell! OUR class!!! Sagong Jin, Jeff and I. This is our silly pose. My notes- PROOF! I am learning! Overall, I know that Jeff and I are both really satisfied with our time at the YMCA. We have made some great friends and learned a lot. 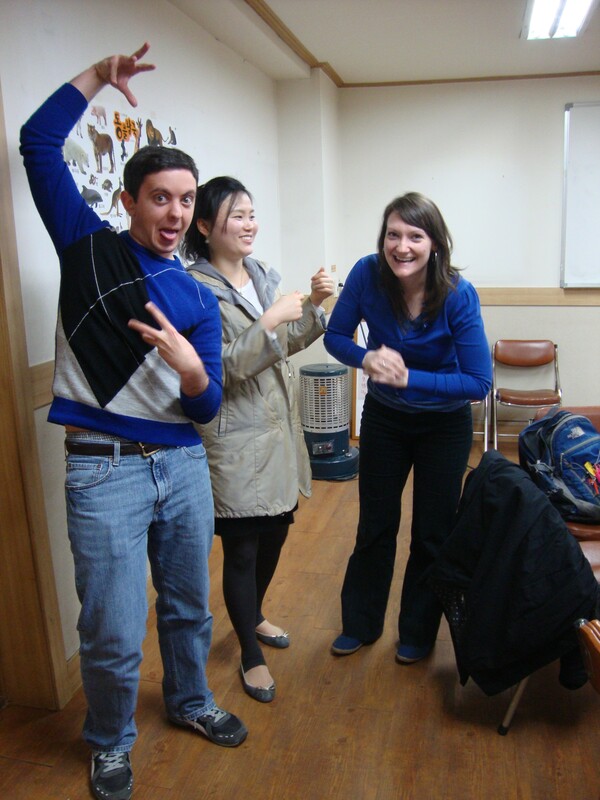 If you live in Daegu and happen to read this blog- e-mail me if you are interested in taking classes!! 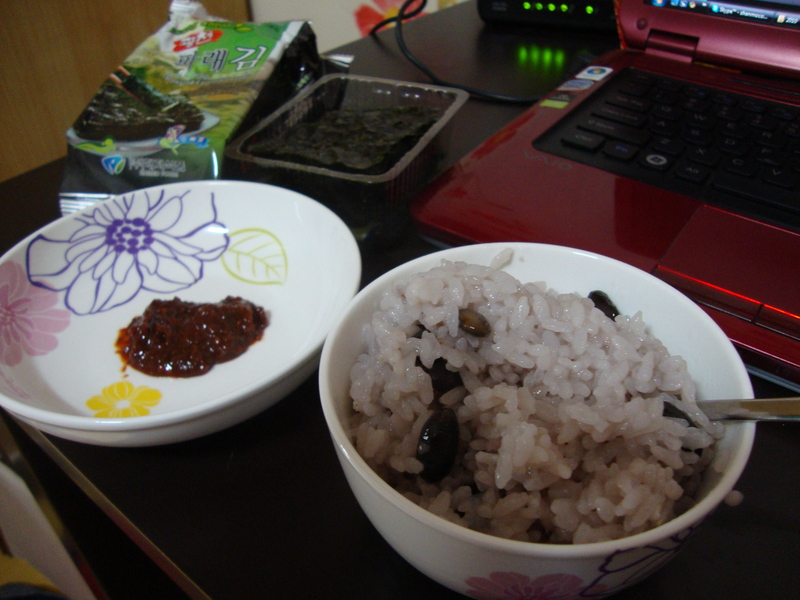 My breakfast, lunch and dinner recently...I need to buy more food. 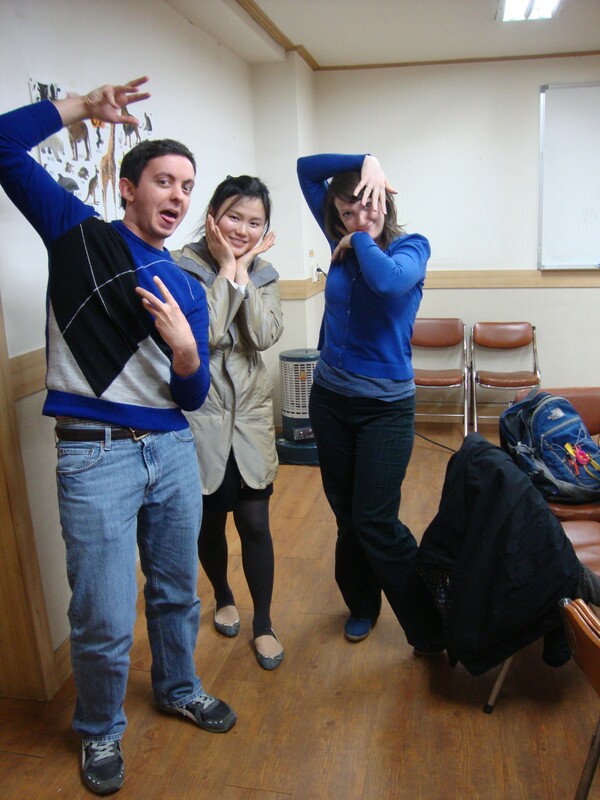 I am beginning to understand Korean school culture a little more with each day. It is drastically different but so much the same as American school culture. Teachers are still closed off and too busy to focus on anything other than their one track mind- surviving and teaching their homeroom students everyday. That poses a problem for me then you see because, classes come to my classroom to learn English and there are times when I don’t even know what is going to happen in class because the teacher didn’t meet with me during our scheduled meeting time. I work with 5 coteachers. One of which is my main co teacher and we spend all day together anyway- so we haven’t had a problem. There are 3 co teacher thats I work with once a week only for 40 minutes and I don’t think its high up on their priority list to let me in on the goods for their class. I had to repeatedly say- I like to plan things for class. I would love to help with the planning, the stuff that happens before class AND while in class. I kept pushing and pushing until one day I just said “I can’t only do Listen & Repeat, I will go crazy.” It is embarrassing to me. I can be a good teacher if they’d let me.I know that I must stay positive and know that its not that bad. Things aren’t that bad! I just think that maybe, just maybe having a degree in teaching- studying ways that people learn and knowing what makes someone learn something is counting against me. 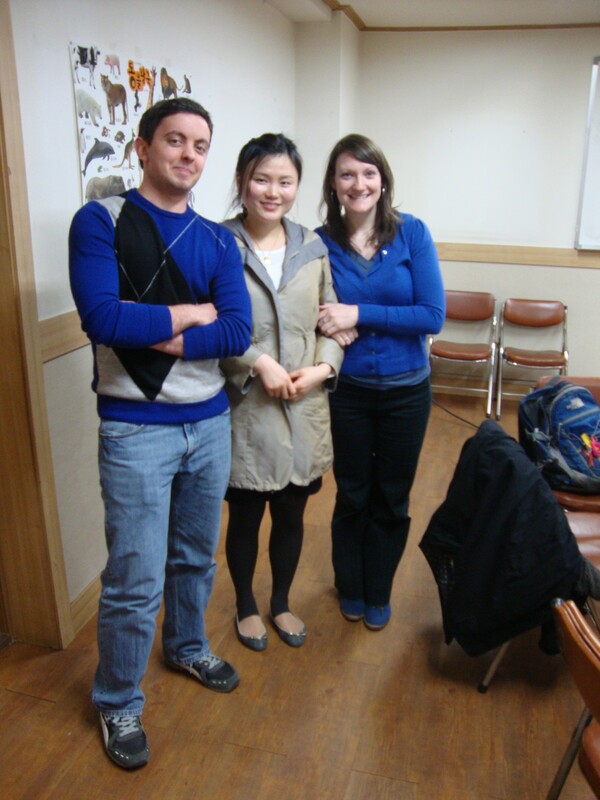 So maybe for future EPIK teachers if you have a teaching degree maybe S. Korea isn’t the best place to come and teach. On the bright side though, I am getting a new perspective on how to do things within a school system and how to treat your teachers. Korea does something right about this. Okay, for teachers it is mandatory to stay until 4:30 everyday but that forces people to use their prep time for hopefully good things. I don’t know how I feel about handing in lesson plans and having the vice and principal sign off on what you do…but I think that giving teachers time during the school day is a brilliant idea. The teachers at my school get 1 hour for lunch- 1 HOUR. That means that the kids play for 1 hour as well. Oh, did I mention that the kids play unsupervised and are able to go wherever they want around the school property. Yeah, and its harmonious. Crazy right? They go to play soccer and tag and hang in the bleachers with their friends if they want. I asked about this though- “Don’t students get into tiffs or get into trouble?” The answer was “these students are always fighting but nothing serious has ever happened.” She was right, Korean students FIGHT ALL THE TIME. Its irritating they are constantly slapping each other, pinching. The slaps are not soft AT ALL either, and they are exchanged from girl to boy, boy to girl, boy to boy and girl to girl(although this is more rare). Another aspect of Korean school culture is the bureaucracy, hierarchy part. You have to make sure that when handing something in, getting a signature or approval you go through the right tier levels. For me to leave an hour early to go get my internet and cable hooked up. Now, don’t get me wrong- the people I work with are really caring and I love my students. I mean, on Friday one student came into the English room and said “I have a gift for you,” I think she was practicing that phrase all day. Then continued to pull out of her bag a pencil holder! I really am having a good time, adjusting is my life and I think feeling a certain level of being uncomfortable all of the time can take a toll on you. I made a slide show of what I have been up to recently. I tried smilebox slideshow but its not that good. If anyone has any other suggestions I am looking for a better one!!! 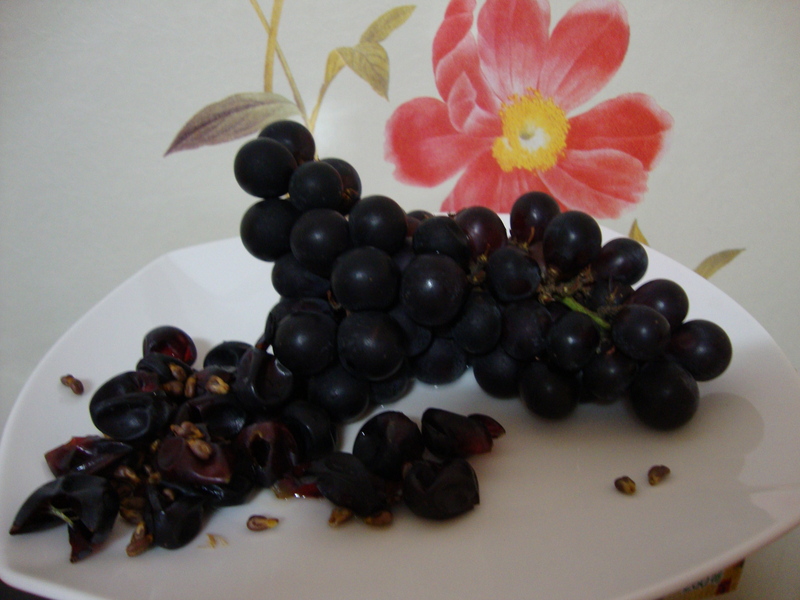 Grapes with the skin off. Oh, its okay to spit them out on the plate too- you don't have to be dainty about it.